This is a quote taken from BHOV’s response with regards to a further extension of Article 50. As we reached 1000 days on from the June 2016 referendum result, we asked our members if they would like to write an open letter to Europe. These letters contain their thoughts and feelings, both on Europe and on living there. In June 2017, we were delighted and honoured to be awarded the European Citizen's Prize 2017. 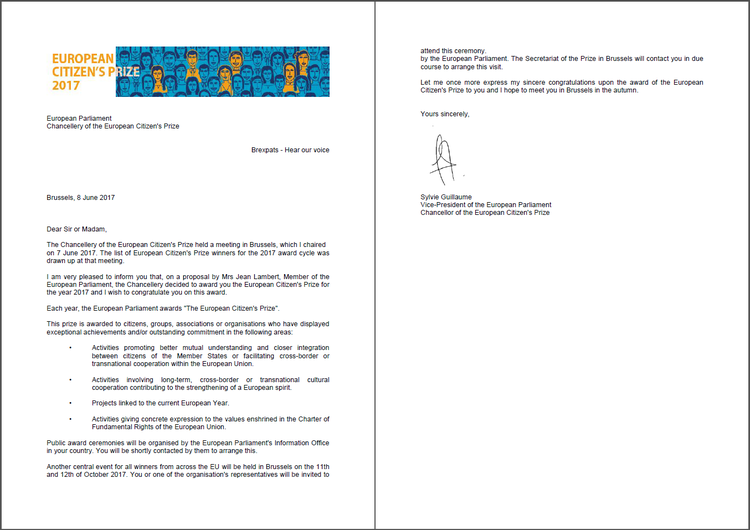 Thank you to Jean Lambert MEP for the nomination and to the EU for the recognition. And of course to everybody who has contributed to Brexpats HOV and has helped us secure this award. The Campaign For Europe blog provides additional information about this award. This can be accessed here. The Medal was awarded to Debbie Williams by Eduard Slootweg on behalf of the European Parliament. There were 20 attendees from BHOV. Dutch MEP Eduard Slootweg congratulated Debbie and the Group as he presented the medal. The outstanding group of people who have worked together so hard to achieve this, and the two younger members who gave their testimonies. BHOV were nominated for the award by Jean Lambert. Sadly she was unable to attend, so the video below is her message for the ceremony.